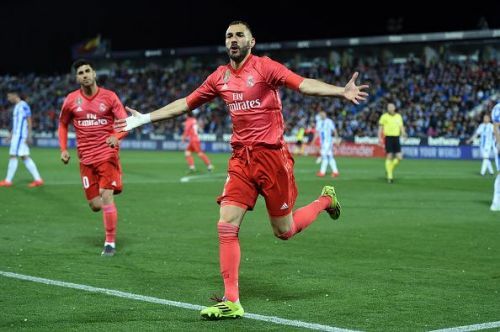 Following a 1-1 draw against Leganes at the Estadio Municipal de Butarque, Real Madrid boss Zinedine Zidane heaped praise on his compatriot Karim Benzema, who helped the Los Blancos salvage a point against the Los Pepineros. Jonathan Silva drew first blood as the left-back curled the ball out of Keylor Navas' reach to hand a 1-0 lead to the hosts late into the first half. Early in the second half, Luka Modric found Benzema with a splendid through ball. However, the Frenchman couldn't get the better of Pichu Cuellar with his initial attempt - though he was quick enough to claim the ball on rebound and score from a tight angle, right through the hands of the Spanish shot-stopper. In what has been a dreadful season for the Los Blancos, the Frenchman has enjoyed his form in front of the goal. The 31-year-old sharpshooter has scored 27 goals and set up another 10, across all competitions this term. The four-time Champions League winner has netted five goals in his last four La Liga appearances. Real Madrid are rumored to sign a new striker at the end of the season. However, the Frenchman's exploits this season might make them re-think about their decision. "He's used to that, to the rumours that players are coming, but for him, it does not change anything. He showed his personality and that's it, he's doing well for the team, he's doing a lot of goals. I'm happy." Following a 1-1 draw against the eleventh-placed side Leganes, Karim Benzema and co. will host Athletic Bilbao next in the La Liga.